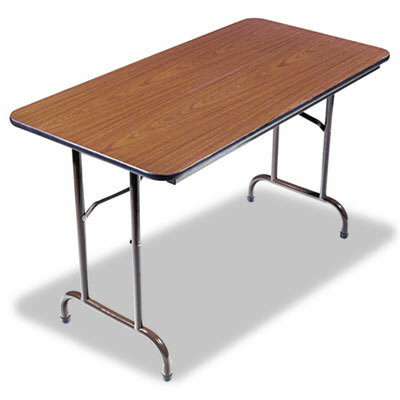 Scratch-resistant melamine top is 5/8" thick with a one-piece, 1 3/4" brown steel apron and black vinyl edging. Gravity leg-locking mechanism makes set-up quick and easy. Folds to 2 1/2" thick and locks for easy transport and storage. 1" diameter, brown steel legs have black plastic foot caps to protect floors. Holds up to 1,200 lbs. evenly distributed.